Call them a ‘power couple’ or the monarchs of the politics, Michelle and Barack Obama have considerable influence being the first lady of the US and the President respectively. Ever since the couple began their combined supremacy when they got married in 1992, they have stood flawless and highly professional. But what we need to value the most is their romantic side amidst their agendas, hectic political meetings, speeches, and super-busy official tours. They attract a lot of media attention for being a perfect dreamy couple. No wonder they are like a political force together but their professionalism doesn’t come in the way of their marital and romantic chemistry. In fact, their relationship and devotion to each other is always the subject of news headlines. So, let’s have a look-back at their legendary love and also enjoy the collection of photographs relating to their love story that started decades ago. It was a law firm that drew the couple together forever. Little did Michelle know that she was mentoring the rising star and the legend-to-be in 1989 at Sidley and Austin law firm, Chicago. Nearly two decades back, Michelle Robinson was working as an advisor to Barack Obama who was then doing summer intern from Harvard Law. 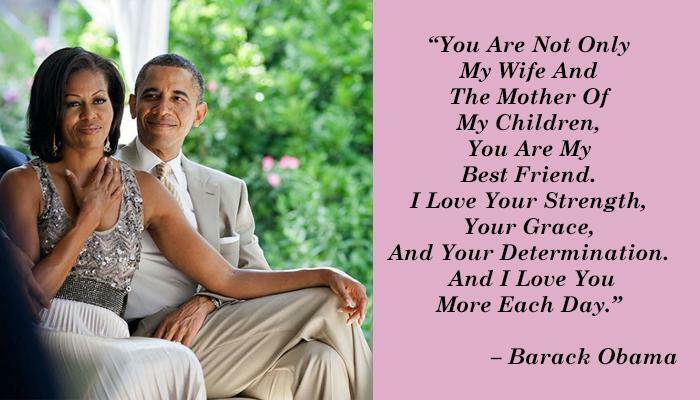 Cupid struck right away and madly-in-love, Obama made the first move. He decided to woo his lady and extend the affair to a husband-wife relationship. The then newbie couple had a successful first date which was all about sightseeing and a movie. And interestingly the movie they watched was symbolic to what they did next. It was Spike Lee’s ‘Do The Right Thing’ that they went to watch in 1989 a Harper Theatre, Chicago and perhaps they did the right thing to become life partners. They dated for three years before getting married. Before getting down on his knees, Barack made sure his lady says ‘Yes’. He planned the proposal at a restaurant as he knew that there was always something special about popping the question over a romantic meal. They went for an occasional celebration at Gordon’s restaurant in Chicago where the waiter put a special spin to the evening offering them a dessert tray having a ring placed on it. And this is how the love saga began. Isn’t it so romantic? The couple got married on October 18, 1992. The lifetime decision brought happiness and success not only in their personal life but to their professional life as well.